"It's kind of staying the course." 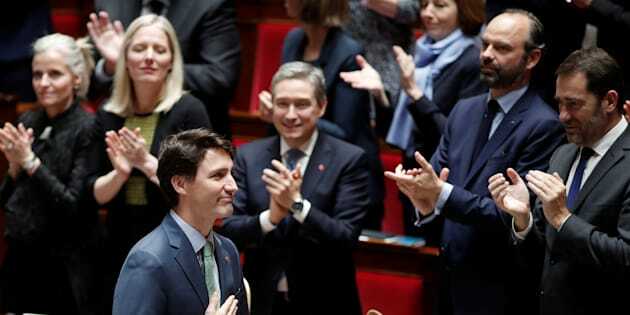 Prime Minister Justin Trudeau is applauded by French Prime Minister Edouard Philippe, members of the French government and members of Parliament as he arrives to deliver a speech at the National Assembly in Paris on April 17, 2018. OTTAWA — Canada's latest greenhouse gas inventory report to the United Nations shows emissions are starting to trend downward, but not nearly at the rate needed to meet the country's international commitments under the Paris climate change accord. The report was made public Tuesday, as Prime Minister Justin Trudeau was at the National Assembly in Paris lauding both Canada and France as international leaders on climate change. "It is up to us to make this agreement in principle a reality," Trudeau said in French in his speech to the assembly. "It is up to us to ensure that our children and grandchildren can breathe fresh air and enjoy the great outdoors like we did." Canada and France signed a partnership agreement on climate this week, agreeing to help get other countries to agree to implement carbon pricing systems, improve energy efficiencies and cut emissions across all forms of transportation. But Canada is still quite a distance away from meeting its own commitments under the Paris accord, the latest UN emissions filing shows. The report — which Canada must file annually as part of its international climate commitments — shows Canada emitted 704 million tonnes in 2016. While that is down 1.4 per cent from the year before, Environmental Defence's national program manager Dale Marshall says the decrease is so small it's nothing to get excited about. "It's kind of staying the course," said Marshall. The number leaves Canada 187 million tonnes away from its Paris commitment to get emissions to at least 30 per cent less than they were in 2005 by 2030. To meet that target, Canada can't produce more than 517 million tonnes of emissions in 2030. In comparison, 187 million tonnes is the amount produced annually by 40.6 million passenger vehicles, or nearly twice as many cars as were actually on Canada's roads in 2016. Catherine Abreu, executive director of the Climate Action Network Canada, said Canada acknowledged to the United Nations in December that its current policies, including the Pan-Canadian Framework on Clean Growth and Climate Change, still leave the country 66 million tonnes shy of its Paris goal. This report, she said, changes nothing about that and, in fact, once again points out emissions from producing oil and gas and from road transportation are still rising. The energy and transportation sector accounts for eight of every 10 tonnes of greenhouse gases produced in Canada, including 1.5 tonnes from oil and gas production and three tonnes from road transportation. Between 2005 and 2016, upstream oil and gas production emissions rose 47 per cent and road transportation was up 11 per cent. "It's so, so, so obvious that those are the two areas where we need to target, but one is where the government is reluctant to act and the other is where it's very, very tricky to act." Abreu and Marshall both say the government is making the oil and gas industry do very little to cut its emissions apart from some regulations to reduce the amount of methane that leaks from pumps and facilities and even the implementation of those rules has been delayed. Abreu said there has been a lot of work done to cut emissions from cars, with the advent of more electric vehicles, but the trucking and freight industry are a bigger problem that it is a struggle to address. The biggest decline in emissions since 2005 has come from electricity and heat production, which fell 33 per cent, largely as coal was abandoned as a source of fuel. Canada has committed to phasing out coal entirely as a source of electricity by 2030.